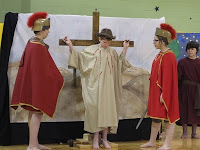 Sunday morning, our CCE students were invited to watch the middle school CCE students perform a living Stations of the Cross. 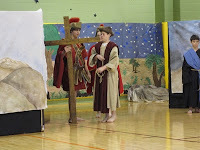 Like many others, our parish offers the opportunity to pray the Stations of the Cross every Friday during Lent, but I’ve only attended this living version with my CCE students. 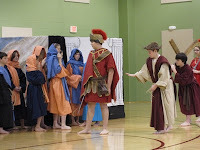 Eighth graders portray Jesus, Mary, Simon, Veronica, the guards and the women, with a narrator introducing each station and reciting a prayer about that station. When Jesus is crucified, a lone guitarist played Were You There When They Crucified My Lord, a beautiful haunting melody. The song played again at the end when they placed the stone in front of the tomb. 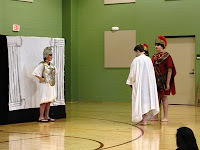 I love that our church offers this opportunity to the younger students to witness the stations acted out. 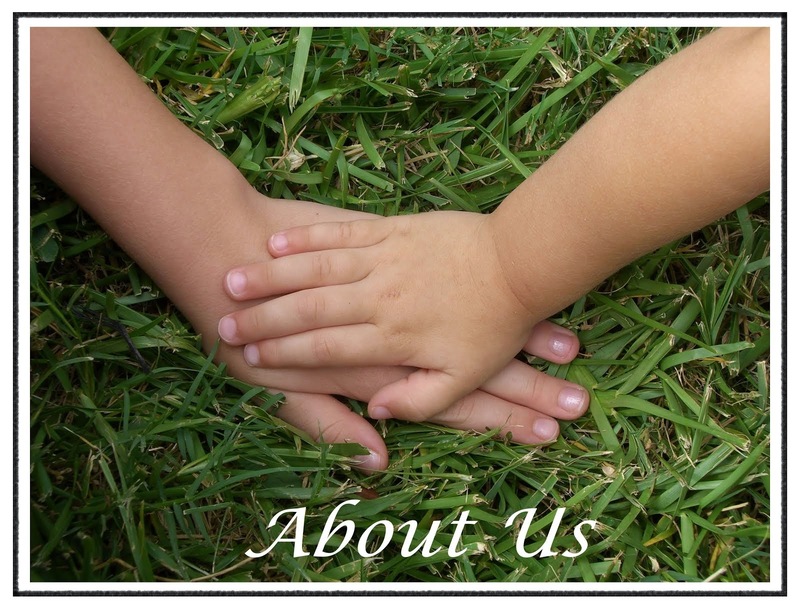 Growing up in a world of media, television, video games, our children are surrounded by visual learning. 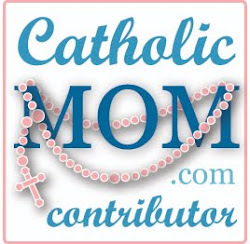 What better way for them to understand and develop their spirituality, so that as adults they too might feel the desire to prayerfully meditate on Christ’s passion. The First Station - Jesus is Condemned to Die. 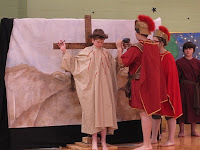 The Second Station - Jesus Carries His Cross. The Third Station - Jesus Falls the First Time. 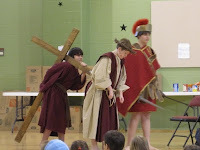 The Fifth Station - Simon Helps Jesus Carry His Cross. 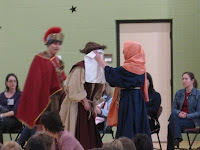 The Sixth Station - Veronica Wipes Jesus' Face. 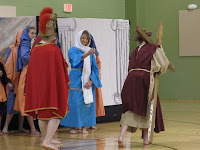 The Seventh Station - Jesus Falls the Second Time. The Eighth Station - Jesus Meets the Women of Jerusalem. 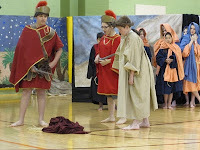 The Ninth Station - Jesus Falls the Third Time. The Tenth Station - Jesus is Stripped. 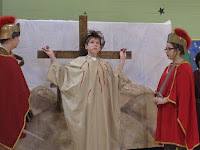 The Eleventh Station - Jesus is Nailed to the Cross. 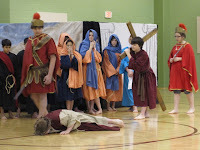 The Twelfth Station - Jesus Dies on the Cross. 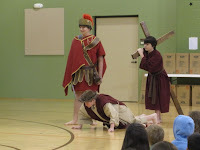 The Thirteenth Station - Jesus is Taken Down from the Cross. 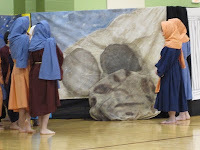 The Fourteenth Station - Jesus is Laid in the Tomb. 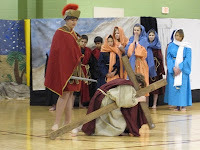 I’d never really considered the history of how and why this tradition came about in our church, but found a well-written essay on the origins of the Stations of the Cross from Our Sunday Visitor. 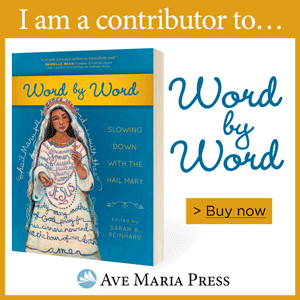 I encourage you to read it, but a very short summary might be: Medieval travelers making a pilgrimage to the Holy Land would stop and pray at specific locations along a route from Calvary to Pilate’s home in their effort to connect with Christ’s passion, suffering and death. Upon returning home, many pilgrims brought back sacred relics and fostered a desire to recreate this sacred way for those who couldn’t travel and experience it firsthand. The Franciscans are often credited with the modern development of the Stations of the Cross; Pope Innocent XI granted them the exclusive right to build stations in 1686. Pope Clement XII extended the right to non-Franciscan churches in 1731. Knowing this brief history, I can almost picture it in my minds eye. Travelers coming to connect with Christ, to seek Him in the physical as well as the spiritual; being so moved by the journey that they feel called to bring the experience to others. I hope you have an opportunity to walk and pray the Stations of the Cross during this Lenten season.